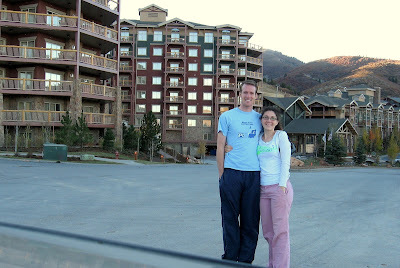 As you can see on our google calendar we went on weekend vacation to park city, UT. We stayed at the West Gates resort for 2 nights. It was probably the nicest room I have ever stayed in yet it had the hardest pillows I have ever encountered making for a very uncomfortable nights sleep. We stayed there for free but we did have to go to one of the seminar things where they try to sell you a time share. Our salesman was really cool though he talked to us over dinner about being mormons, and his vacations etc. He then said to us I can tell in the first min. if someone is interested in time shares and I can tell that you are not so lets both save each other a little time and we'll get you the tickets to your room. It was not as horrible as I thought that it was going to be. Hooray for relaxing vacations!!!!!!! Hey I just thought I'd check in and see how everything was going. Looks like you're having lots of fun as usual! I can't believe my bro-in law is practicaly part of your family and didn't tell me about Chances arm. Poor kid! I hope Sy didn't have anything to do with it... maybe that's why I never heard! oh yeah, jeff knows what's up! he knows what gonna happen!! !